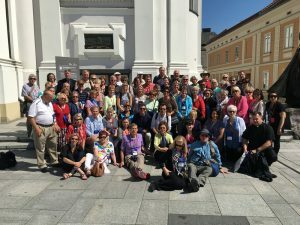 Walking in the Footprints of St. Pope John Paul II’s Childhood and much more! Enjoy our packed movie of the misty sunrise over the mountains of Zakopane, the mountain drive to Wadowice the hometown of Pope JP II. We toured the marvelous museum and walked in his childhood footprints. Mass in the Basilica of Our Lady of Kalawia (Fr. Darryl Roman’s homily) as we watched local Poles praying the Stations of the Cross, joining us for Mass and hiking on pilgrimage. We arrived in Krakow where World Youth Day took place two weeks ago. Enjoy this fast-paced and fun video.